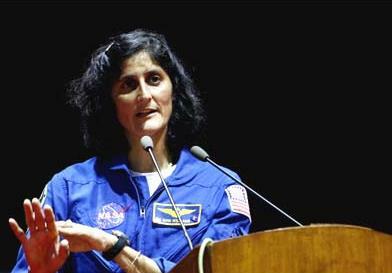 New Delhi, April 1 : Lauding Indian space agency ISRO, US astronaut Sunita Williams Monday said it was doing an excellent job and wished that more Indian American women follow her and the late Kalpana Chawla into space. "India is doing excellent in space programme and has a huge resource of people. ISRO (India Space Research organisation) is doing a great job," Williams told IANS. She also praised India's lunar mission (Chandrayaan-1 and 2) and the Mars exploration mission schedule for later this year. India and the US have agreed to cooperate on future missions to the Moon and Mars after successful collaboration in Chandrayaan-1 lunar mission. Chandrayaan-1, which carried two National Aeronautical and Space Administration (NASA) instruments, successfully found water particles on the Moon's soil with the help of a US instrument. Williams also wished for India to produce more astronauts like Kalpana Chawla - the first Indian-born woman to go into space. "I hope of another Kalpana Chawla going there (space)," said the US Navy captain, clad in a blue flight suit of the kind astronauts wear in space. Chawla, who hailed from Karnal in Haryana, was killed in 2003 when the space shuttle Columbia exploded on re-entry. Williams, whose father is from Mehsana in Gujarat and who was born in the US, said she was never nervous or afraid after the Columbia explosion. The astronaut said she would love to be part of the next space mission. "I would love to be on the next spacecraft for the next mission to space and give my expertise to the experiments being done," added Williams, who also holds the record for the longest spaceflight time by a female astronaut - 322 days in space on two missions. Her India trip started in New Delhi Monday, where she interacted with students at the National Science Centre. During the week she will be interacting with students in Kolkata, Mumbai and Gujarat.